Tubz Brands has been active in vending since the year 2000. From the outset Tubz have continuously developed, innovated and improved our vending concepts to ensure our products and equipment are always at the forefront in the market place. We operate with a dedicated team of professionals based in the UK who combine a great deal of experience in the fields of vending, product development, marketing, manufacturing and logistics. The Tubz Group Manufacture both the vending machines and product fillings which gives us complete control of the supply chain ensuring better stability for our customers, franchisees & licence / marketing partners. This also enables us to respond to market trends and the specific needs and tastes of our customers no matter where they are located. We currently supply our products all over the world: UK, Europe, Asia, Canada, Australia & South America. Tubz have Manufacturing facilities, distribution facilities and offices in the UK, China and in the Netherlands. Tubz Europe is part of the Tubz Brands Group based at Sittingbourne in Kent, UK. The Tubz Group together employ over 60 people and in 2015 produced over 10 million Tubz vending products which were sold through its network of customers and franchisees with in an excess of over 30,000 venues including large corporates sites such as: Marsden’s, Green King, B&Q, Homebase, Toys R Us, Council run leisure centres, Shopping centres Bowling Alleys, and hundreds of other businesses types . This means a product is purchased somewhere in the world from a Tubz Group vending Tower on average every 3 seconds! All our vending tower machines operate without the need for electricity giving them a very low carbon foot print allowing them to be sited almost anywhere as long as there is a through flow of people. Venues such as: bars, pubs, hotels, pool centres, sports centres, swimming pools, barber shops, Retail outlets, business premises etc. Our machines are like silent salesmen who work 24 hours a day 365 days a year. Even while you are away on holiday your machines continue to sell products and make money for you! We vend only the highest quality products sourced from around the world from our vending machines which your customers will notice and help make sure they come back for more again and again. Over the past 15 years we have developed the following successful vending tower concepts which are now well established in the market place to offer something for every customers taste and possible site location to help our network of franchisees & customers maximise their sales and profits! Our Vending concepts. Something for everyone and every venue! 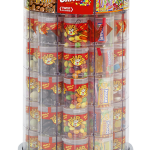 The Tubz Tower is an attractive chrome coloured vending machine which vends small TUBZ pots filled with many different confectionary products including brand names such as HARIBO, NESTLE, SKITTLES, ROLO, TOBLERONE just to name a few! Whether you are at a Children’s play centre, retail outlet, shopping centre or family bar: simply twist and choose the delicious can of your choice! The Pringles is an attractive red or black coloured vending machine suitable for vending 40g cans of Pringles chips and now a selection of branded packet products in our Maxi Tubz range! Whether you are at a bar, pub, hotel, bowling alley or even at your office: simply twist and choose the delicious can of your choice! The Tapas & health Tower is an attractive black coloured vending machine and since its launch in 2016 have been taking Europe by storm! Designed to project a more up market and quality product range the specially designed Tubz are gas flushed and sealed to lock the freshness in. The Tubz are filled with a great range of delicious Tapa portion products such as premium nuts, olives, dried fruits and (mostly raw) nuts with super fruits! A big part of these products are pure and natural without any added salt, sugar or additives. This assortment was created especially for business type places but of course they could perform very well at health centres, fitness centres, sports centres, hospitals but have also work extremely well in bars, pubs, hotels, bowling centres and other retail outlets: simply twist and choose between several delicious Tapa style and healthy Tubz snacks and enjoy! 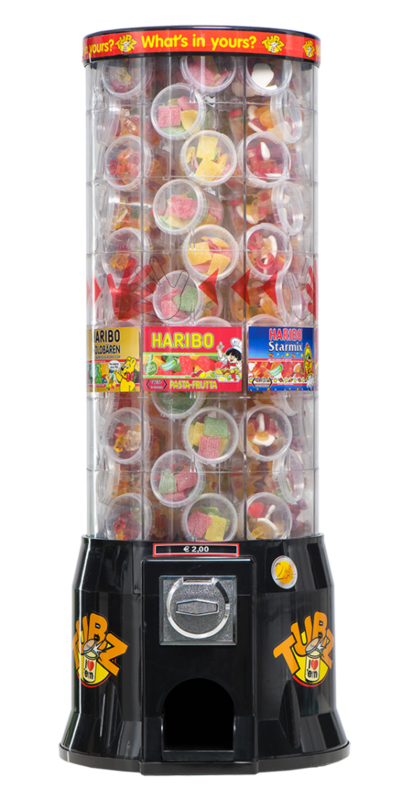 The Mega Tubz Tower is an attractive black or red coloured vending machine which vends big TUBZ pots filled with bothy a Toy / Novelty and Candies. 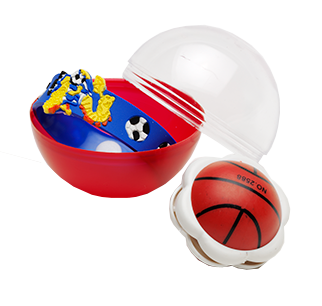 In a world’s first for vending Tubz have developed a revolutionary double compartment which keeps the candies completely separate from toy or novelty. Whether you are at a Children’s play centre, bowling alley, retail outlet, shipping centre or family bar: simply twist and choose any great mix of both toy & treat of your choice! The Toy Tower is an attractive vending machine which vends round TUBZ capsules filled with many different toys included brand names such as Disney, Marvel & Frozen. Whether you are at a Children’s play centre, retail outlet, shipping centre or family bar: simply twist and choose a fantastic toy or novelty item every time! If I can be of any further help please do not hesitate to give us a call on 0044 (0)845 601 9001.